Product prices and availability are accurate as of 2019-04-23 21:45:01 UTC and are subject to change. Any price and availability information displayed on http://www.amazon.com/ at the time of purchase will apply to the purchase of this product. Let your baby sleep sound and comfortably without the annoying mosquitos, flies, bugs and insects at home or outdoors whenever needed. Simply unwrap the tent and it pops open automatically providing an instant safe place for your baby to sleep in. Included soft padded pillow and mattress maximize comfort while the see-through mesh tent enhances air flow to maintain an optimum temperature. 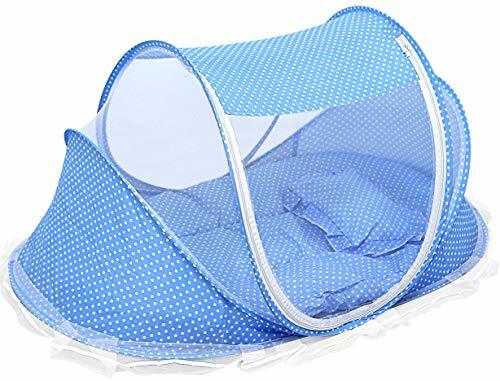 WHAT IT DOES - Keeps out mosquitoes, flies and other annoying insects while providing a safe, comfortable and inviting place for your baby to sleep sound in WHAT'S INCLUDED - Includes a mosquito tent, pillow, mattress, music box and carrying mesh bag. Soft padded pillow and mattress designed for babies for maximum comfort. Music box helps get baby's attention and sing baby into sleep. EASY & SAFE - See-through mesh tent enables easy clear viewing of your baby and enhances air flow for maintaining an optimum temperature. Tent pops open on unwrapping and easily collapses down to be put into the carrying bag so that you can take it along with wherever you go at the beach, backyard, pool or travel. Two way zipper makes the tent easy to access. FOR AGES - Suitable for 1-3 years old depending on body height CARE TIPS - Care tips: hand wash with a little soap, rinse well and air dry.